In recent years Apple have been strengthening their focus on business with an ever increasing range of enterprise apps and accessories. Below we take a look at the steps involved in rolling out iPad devices to your organisation's employees. The Apple iPad is becoming more widespread in the workplace. Portability, versatility and ever closer integration with both Apple and non-Apple technologies has made it a compelling device for all sorts of organisations. Even better, its sheer popularity in the home makes it likely that some of your employees will already have some familiarity with certain aspects such as iOS, Apple ID and iCloud. Of course, setting up an individual personal iPad at home is one thing; deploying dozens - or even thousands - across an organisation is quite another. Fortunately, Apple have developed some useful services and solutions to make the deployment of iPads in the workplace a much smoother process than you might think. Deployment is typically carried out by an IT administrator with a clear understanding of how the devices are to be used. While each of the services and solutions provided by Apple are comprehensive enough to warrant their own instruction guide, here we will just outline the general process, with links to supporting information where appropriate. 1. Prepare your IT environment. Check that your company's Wi-Fi network is capable of supporting multiple devices with simultaneous connections from all users. Many enterprise networks will already have this in place, but it's important because cloud-based activity is 100&percnt; dependent on consistent and reliable network access. Also, their portability means that iPads could end up anywhere, so don't forget to allow for sufficient coverage throughout each office and work space where the devices could be used. If you experience any problems when trying to connect iPads to Apple's activation servers, iCloud or the iTunes store, check your web proxy or firewall ports as these may need to be configured. Bonjour is Apple's network protocol that enables devices to find services on a network automatically, for example, connecting to AirPrint-compatible printers and AirPlay-compatible devices such as Apple TV. Given its central role in the Apple ecosystem, it's worth checking that your network infrastructure is set up to work correctly with Bonjour so that you can take full advantage of this. Check that routers are compatible. Most companies will be familiar with Microsoft Exchange and/or Office 365. If your organisation uses Exchange, check that the ActiveSync service is up-to-date and will support all users on your network. If you're using the cloud-based Office 365, remember to check that you have sufficient licences to support the anticipated number of iOS devices that will connect to it. iOS also works with other protocols including IMAP, POP, SMTP, CalDAV, CardDAV and LDAP. Mobile device management (MDM) lets you wirelessly configure and manage all your devices, whether they're owned by the employee or the organisation. Specifically, MDM lets your company securely enrol devices, update iPad settings, monitor compliance with company-wide policies and remotely wipe or lock devices. MDM solutions are offered by third-party providers and can be cloud-based or require installation to an on-premises server. Features and pricing differ between solutions. Before you select your MDM solution, it's a good idea to spend some time evaluating which MDM features are going to be most relevant to your company. Read more about MDM on Apple's website. This is a caching feature built into macOS Server that helps to reduce bandwidth by storing content locally including apps, books and documents. Software downloads and updates typically consume a lot of bandwidth and take time. Caching server helps to speed this up and works with software from the App Store, Mac App Store, iTunes Store and iBooks Store. Note: Since macOS High Sierra, content caching is built into the client operating system. Read more on Apple's website. Once you've decided how many devices your organisation will need to deploy, you should begin the search for a robust charging solution. These take many forms, but if you have more than a handful of devices, you will be best served by an all-in-one charging and storage unit. An iPad charging cabinet is useful if you want a fixed home for all devices. A charging trolley also serves as a reliable storage solution but has the added benefit of letting you move multiple tablets around your workplace in bulk. 2. Enrol in Apple Business Manager. 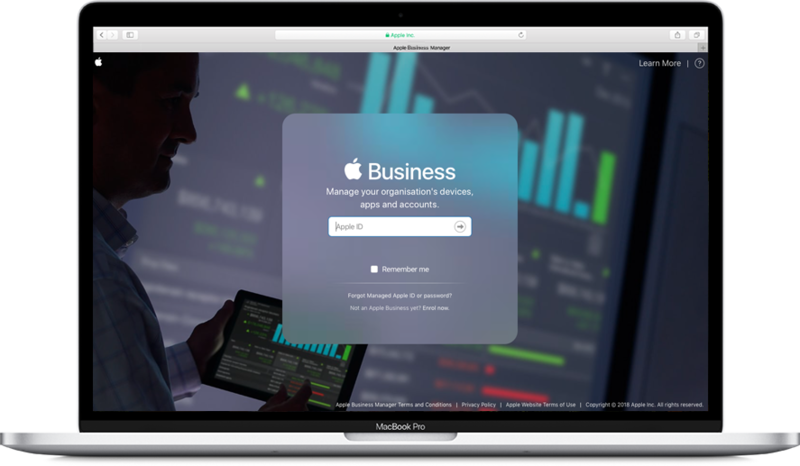 Apple Business Manager is the secure web-based portal where IT teams enrol devices, purchase and distribute content and manage user roles within their organisation. You can access it from anywhere to create staff accounts, deploy devices, and manage apps and content. The account associated with this email address will become the initial administrator for Apple Business Manager. Your email address must not already be associated with an Apple ID or any other Apple service. As part of the enrolment you'll be asked to provide a verification contact who can confirm you as the initial site administrator and verify that you have the authority to act on behalf of your company. After you've submitted the application, Apple will review it and may get back to you or your verification contact, by phone or email, to request further information before the enrolment is approved. Once your business is enrolled in Apple Business Manager, and your verification contact has confirmed you as the initial administrator, you'll be invited to create the initial administrator Managed Apple ID. After that, you'll be able to set up additional administrators, if required, to manage the service on behalf of your company. You can also then enter purchase information and assign different roles to begin managing devices and content. Note: If you enrolled in Apple Deployment Programmes on or after 26 February 2014, your organisation may be able to upgrade to Apple Business Manager. Log in to deploy.apple.com using your Apple Deployment Programmes Agent account and following the onscreen instructions. The upgrade process should take only a few minutes. To upgrade with a Mac, use Safari version 11 or later. PC users should use Microsoft Edge version 25.10 or later. 3. Set up your devices. Apple Business Manager now incorporates all the current features from the Device Enrolment Programme (DEP) allowing you to deploy and configure your company-owned iPads from the same interface. You can establish a connection to your MDM servers from Apple Business Manager. To add a new MDM server connection, enter a name and authorisation details. It's important that each server is recognised by Apple and authorised to manage your devices. For additional security, two-step verification is now used when authorising an MDM server. If you need assistance with your MDM solution, you should consult your provider's documentation and support channels. iPads purchased direct from Apple or from an Apple Authorised Reseller can be assigned to your MDM server by entering the order number or serial number. On Apple's Device Employment Programme website, only eligible devices will be available for you to assign. If you acquired iPads from a difference source, these can also be added to Apple Business Manager but in this case you'll need to use Apple Configurator 2. After you have set up your MDM server(s) and assigned iPads, you will be able to review all your device assignment information in Apple Business Manager. 4. Deploy apps and content. The App Store and iBooks Store are both available from inside Apple Business Manager. You can search for content, specify the quantity to order and complete the transaction using VPP Credit (Volume Purchase Programme) or a corporate credit card. Apps and books can then be distributed using your MDM solution or or Apple Configurator 2. You can assign apps directly to one or more iPads using your MDM solution or Apple Configurator 2. The app will be pushed to that iPad by MDM or added by Apple Configurator 2; no invitation needs to be sent to the employee. Once assigned, anyone using that iPad will have access to the app. This method is useful if your company wants to keep full control over managed devices and/or if it's impractical for every user to obtain an Apple ID. If employees are using their own personal Apple ID on the iPad, you can assign apps and books to their device via email or push notification message as long as their iPad is running iOS 7 or later. Once they agree to the invitation and accept the iTunes T&Cs, they are automatically connected to your MDM server where they can download the assigned apps and books. With the employee's consent, this gives the company control, while keeping their personal Apple ID private and invisible to the administrator. To assign apps to an iPad without an Apple ID requires iOS 9 or later and macOS 10.10 or later. If you have any questions about charging and storage solutions for multiple iPads, we'd be happy to help. We also create products for charging other makes of tablet, laptop, smartphone and smartwatch too. To discuss your needs, get in touch with us using the form below. © 2018 Apple Inc. All rights reserved. Apple, the Apple logo, iPad, Mac and iTunes are trademarks of Apple Inc., registered in the US and other countries. iCloud is a service mark of Apple Inc., registered in the US and other countries. Information on this page is for guidance only and cannot cover all circumstances. Whilst every effort is taken to avoid errors, we cannot accept responsibility for any errors it may contain. You are advised to consult your service and product providers directly for their latest specifications and instructions. Please tick this box to confirm you are happy for us to email you about our products and services.